Plunger Pump High Pressure triplex / Quin Tuplex plunger pump. We are the pioneer of the industry engaged in offering High-Pressure Homogenizer in the market. 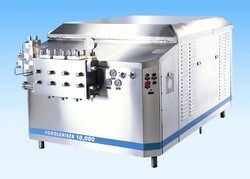 We are instrumental in offering Dairy Homogeniser to the esteemed customers. The entire range of homogenisers is fabricated using high-grade raw material and components. These homogenisers require low maintenance. High pressure Homogenisation increases the consistency of a product by dispersion. The product is displaced by the generation of high pressure and forced through homogenising valve gap. Moreover, cavitation turbulence and sheer force break the products of less than 1 micron particles. We are one of the trusted names of the market engaged in offering a high quality range of Lab Homogenisers. 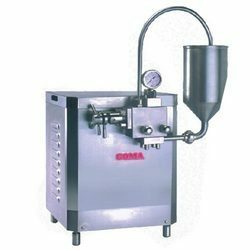 These homogenisers are fabricated using high quality raw material and components that are procured from some of the most trusted vendors of the industry. Moreover, we check these homogenisers on certain quality parameters to gauge their flawlessness.